Our stakeholders—including patients, consumers, customers and investors—are increasingly interested in knowing more about our global procurement practices. The purchasing power of global manufacturing companies is a key asset, but can become a source of significant risk if not managed responsibly. We believe that improving supply chain transparency and sustainability not only creates value by reducing sourcing risks and protecting our brand reputation, but can also have far-reaching positive impacts on society and the natural environment. As the world’s largest, most broadly-based healthcare company, Johnson & Johnson maintains operations in virtually all countries of the world and works with more than 70,500 suppliers across our three business segments. 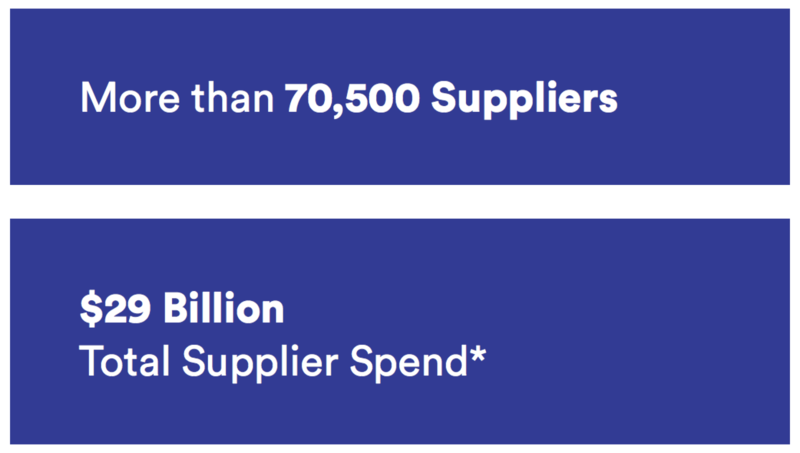 We manage a highly complex network of supplier relationships that are critical to business success and our ability to fulfill our obligations to those we serve. Our approach to managing a responsible supply base is multi-pronged. We focus on ensuring our compliance with global requirements related to supply chain transparency and disclosure. Our Responsibility Standards for Suppliers reflect our internal values and set forth the expectations we have of all Johnson & Johnson suppliers. We are continuing to evolve our processes to monitor supplier compliance with these Standards, using a risk-based approach through table-top assessments and on-site audits. We also recognize that to create impact at scale, we must move beyond monitoring compliance and collaborate with our suppliers to improve capabilities and share best practices. To this end, our Sustainable Procurement Program helps us expand supplier engagement to a more strategic level. In parallel, we have a dedicated program for supplier diversity, which continues to expand globally. Johnson & Johnson Global Procurement is responsible for managing supplier relations. Global Procurement hosts a dedicated Citizenship Center of Excellence that leads our enterprise-wide efforts to advance citizenship and sustainability with our supply base. The Center of Excellence connects such programs as the Sustainable Procurement and Global Supplier Diversity & Inclusion (GSDI) programs. Global Procurement also works closely with the Environmental Health, Safety & Sustainability (EHS&S) organization when it comes to ensuring supplier compliance with our environmental health and safety requirements. Each category has a category leader who works with the Sustainable Procurement, GSDI, and EHS&S teams to embed social and environmental sustainability requirements and practices into key supplier management processes. In 2017, Johnson & Johnson Procurement organization revisited its procurement strategy. The updated Global Procurement Vision is to partner to shape supplier solutions that transform healthcare. Risk, Reputation and Citizenship are highlighted as a value pillar critical to enabling realization of this vision. Our work to improve compliance, transparency and sustainability in the supply base is a core component of our renewed procurement strategy. 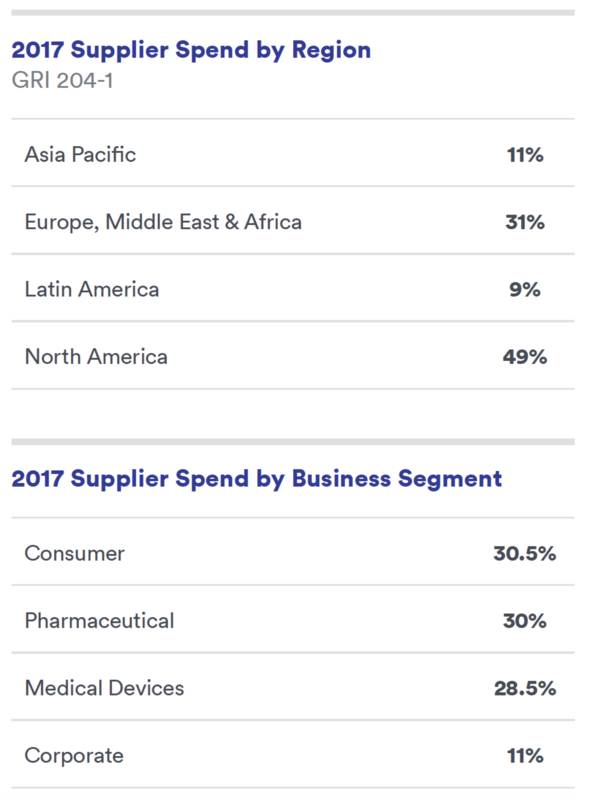 * Total spend represents addressable spend, i.e., products and services that procurement teams can negotiate with suppliers to meet business goals; total spend in 2017 excludes Actelion and Abbott Medical Optics.